sailboat. 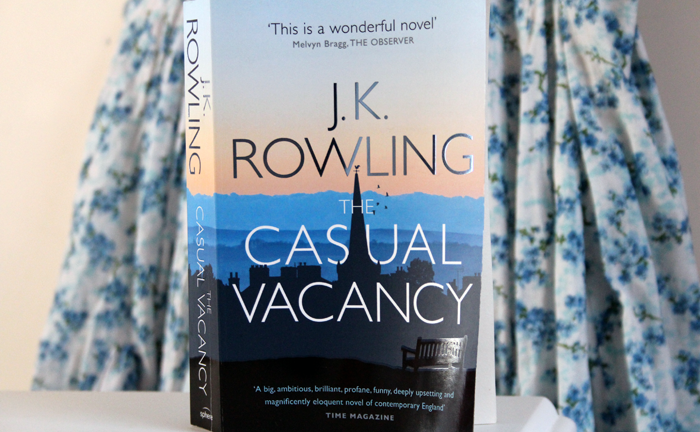 : Bookshelf: The Casual Vacancy by J.K. Rowling. I've put off reading this - and the new book she wrote under the Robert Gailbraith pseudonym - purely because I loved the Harry Potter books and am not sure if I can emotionally invest in new JK work! Silly, possibly! I may give it a go one day bit I have to detach myself first, as you said! Wow five out of five stars Jennie?! I might have to buy it for my kindle! It has been on my list for ages but i have so many other books to get through before I was going to buy it. 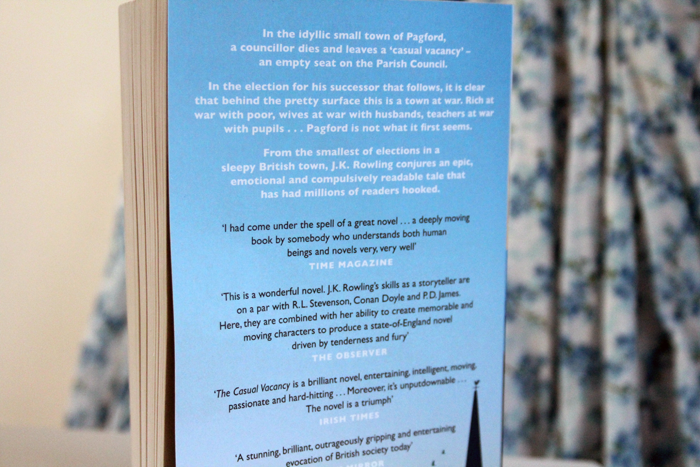 I've heard great things about this book, J.K Rowling is such a talented writer, so I can't wait to read more from her. I haven't read this yet. Not so much because I'm worried about the inevitable departure from Harry Potter, but because I have just not had time to read my way through my apparently endless list. I read this on holiday and it was amazing. It screamed JK, her writing style is second to none and I was totally biased because I love her but this book IS so so good! I'm not into detective books at all, but I may have to pick up the cuckoo's calling next! what a fantastic review! I have only seen negative ones based on the fact - it isnt harry potter, which is a shame, it was one of the first books i got for my new kindle and still havent read it , a year later, this most certainly alters my thoughts! I've also been put off reading it for the very same reasons but after this review, I may just give it a go! I love being so involved in a book that it moves me to tears. I've had this for a while and haven't read it yet... going to start it tonight now! This book has been sitting on my bookshelf unread for the longest time, since the release date even. I've not had the courage to start this story the same reason you had: Harry Potter is pretty much sacred to me. But I'm sure I won't be dissapointed, so I really want to start reading it soon! I'm afraid to say I hated this! It felt like she'd stored up every bad word, every negative phrase and every disgusting possible idea she'd been unable to use in Harry Potter... and just vomited it into The Casual Vacancy. I really didn't see the point of it, and for me, large chapters of it were completely unnecessary and didn't even add anything to the story. I was quite sad I hated it tbh. This sounds great, I adore my books so must give this a look! I saw this book featured and I was unsure if I too, would like it. I read the sample pages and safe to say I like this book and the intricate detailing she proves us the reader with! Admittedly i've never read any of her books (i know, i know, shame on me) but i have a feeling that this book would resonate with me more than the epic wizarding world she created.. It's so amazing when a book actually transports you completely into its world. I always try to vow to myself that i'll read more. I really should. This review is very good :) I haven't read it tho! I love J.K rowling! i dont have this book yet, I follow you at bloglovin. Ah I love what you're reviewing it by 'sailboats' haha so cute. I've ummed and ahhed about reading this, hearing it's good from some and bad from others and there's me not sure if I should ruin the 'magic' behind Rowling and harry potter.. Silly I know! Loved your review, it sounds like a great read-I really should read it haha! i'll get this soon :) sounds great! I haven't read it yet as tbh, the bad reviews have put me off slightly but I will definitely be picking this up off my bookshelf soon! It sounds fantastic, well worth a read. To me nothing beats characters you feel empathy for, or a story that sticks in your mind. To me it was like Harry Potter in the way that she created a world, even though this one was much more like the world we live in. I put off reading it for a while too but I think it's one of the best books I've read in a long time. I'm apprehensive about reading the Cuckoos Calling though. I just never think she'll be able to top her last. I agree with every word you've written! One thing to add in the description of it being 'adult', was at one point reading it on the tube I was as embarrassed as if reading 50 Shades. JK doesn't know about that stuff does she? Oh hang on, it's not Harry Potter... we need to remember that, as you say.